Helping children ages 0-22 make developmental gains through music. Even though Christmas is just around the corner, I am still creating new songs and visuals for my students. One of my co-workers remarked today, as I was standing by the laminater, "why are you making something new! We only have 2 days left this week." At that moment I realized, as I was commenting on her question that making new and exciting visuals for my students is more like a hobby than a job. I LOVE creating new songs and visuals. Yes, I know I have a huge box of music therapy strategies for the month of December I could have pulled from . However, none of them "spoke" to me this year. So, I decided to add a few new strategies to my repertoire. One of the strategies that worked great with all my groups was a parachute game. I used Martina McBrides version of "Let it Snow" put cotton balls in the middle of the parachute and "made it snow." We found it to be quite the challenge to keep all the "snowflakes" in the parachute. What a great way for our kids to work together to get a job done. Another fun activity we did this week was putting cut out snowflakes in an 8 pattern on the floor. I sang "Walkin in a Winter Wonderland" as the students used a reciprocal pattern to walk from one snowflake to another. We even mixed it up and tried jumping, hoping, and stomping through our winter wonderland. Finally, I added a new color song this year. Rudolph!! Rudolph!! I found this cute little poem on pinterest and thought Hey, this would be a great song!! 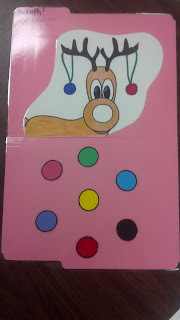 I used the piggyback tune "Twinkle Twinkle" found some clipart on google, drew a few circles and shazam we have a new strategy. Please email @ shaemtbc@gmail.com if you would like the visual. I would be more than happy to share it. Just put "visual for Rudolph" in the subject line. Here is the Poem/song I used!! Enjoy!! Today in my medical fragile classrooms I sang the traditional Christmas song "Do You Hear What I Hear?" As I sang the song, "Ms. Shae style," I introduced different sounding instruments to my students. First singing "Do you hear what I hear? I repeated this several times while I played the selected instrument. As I walked from student to student I looked to see if the students were tracking the sounds, and if they were able to focus on the instruments. I then sang, "A bell, a bell, do your hear the bell. Do you hear the bell as I play... now let me hear Megan play." The students LOVED this activity and love when I put their names in the song we are singing. I was able to introduce the following instruments in one session; wind chimes, bells, castanets, finger cymbals, drum, tambourine, triangle, cabasa (I did change the words during this verse to feel and rolled the cabasa up an down the students arms and legs) and a vibrotone. The students and the teacher loved the activity so much I may just have to pull this one out at other times of the year. After the session I shared with the teacher how she could change up the words even more to say do you see what I see, what I feel etc. Later in the day, I tweaked the activity a little more and used the song to facilitate choice making. I started out with "Do you hear what I hear?" A bell a bell, who wants to play the bell? Who will play the bell for me? Who will play the bell for me?" I then had the student play the instrument one time and put it under his/her chair and fold their hands. We repeated this until everyone had an instrument. Once everyone had an instrument I accompanied the students on my guitar as we played through a medley of carols. I do hope you have a wonderful day!! 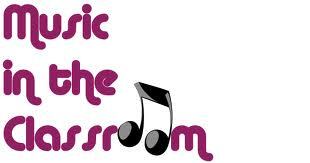 Music can play a major role in the elementary classroom. Here are just a few reasons why! between the teacher and children and among the children themselves. As adults we still remember many of the songs we learned in our childhood. Children with learning disabilities or left-brain dysfunctions often find success with music. The children want to sing the same songs over and over. The repetition helps the child to internalize language. Children who hesitate or stumble over words when they are reading, find that their language flows as they sing. in a song as they keep beat or dance to the music. Learning is further accelerated through movement. Musical Interaction at Home: Why?? This blog segment is going to touch base on why and how we as parents should engage in musical interactions at home and with our children. "Music Therapy Literature reports that most individuals with autism respond positively to music." (DeMeyer, 1974; Exlgerton, 1994; Euper, 1968; Snell.) Why is this you may ask? The obvious answer is, music is motivating and enjoyable! I know personally I will run longer and faster if I have my iPod me. Music can also promote relatedness, relaxation, learning, and self - expression. Music can also provide success - oriented opportunities for achievement and mastery. All the while the structure and sensory input inherent in music helps to establish responses, expectations, positive interactions, and organization. - American Music Therapy Association (2004). Now that we have touched base on "Why" we should use music in the home let me give you a few suggestions as to "How." Here is a basic list of how you can interact musically with your child at home. Why should you sing together? Some may say I can't sing!!! Just remember, your child would rather hear you, with all your perceived flaws than hear a stranger sing perfectly. When I refer to a songbook I am talking about books that can be sung. Many times children may not have any interest in sitting down and having a book read to them yet will demonstrate an increase in focus and attention when a book is sung to them. I currently have a huge collection of children books where the book was created as a visual accompaniment to common songs. Some of my favorites are the new Pete the Cat books, Puff the Magic Dragon, Love Can Build a Bridge, and Sunrise, Sunset. I will break each of the books down on a future blog on how they are used during music therapy sessions. Some songs are created out of books, and can accompany them. Brown Bear, and Today is Monday both by Eric Carle. Remember, reading to your child has proven to be essential for speech and language development!!! Songs can also be used in your home to aide in transitions. Music offers a sensory reinforcment with which to sequence. Music can help reinforce a transitinal moment in a non-threatening manner. Songs offer a means for repetetive instruction. To create a transition song, write a short simple direction repeated with a familiar tune also known as a piggybacked tune. When my children were toddlers I used songs when it was time to clean up toys, when it was ready to eat, using the bathroom, and when we needed to transition from home to anywhere. That reminds me, the kids chose when they were little to symbolize it was ready to get in the car was none other than the "Wheels on the Bus." I would say, the bus is ready time to get in the car!" To this day when I am having a hard time getting my tweeners out the door I will say, "Bus is Ready lets load it up!!" And I must say it still works!! However, the song has been completely phased out. it's time to wash your hands. I love love loved playing rhythm insturments with my kids when they were young!! We worked on concpets such as slow/fast, start stop, loud/soft taking turns and listening to one another. Playing instruments with your child will provide them with a very special and unique musical expereince. You may ask, what type of instruments are out there that we can play. A few basic rhythm instruments are tambourines, rhythm sticks, shakers, and jingle bells. Keep in mind, the instruments do not matter as long as you both enjoy it. Instruments can even be homemade! The quality of the music produced by you and your child is not as important as the quality of the interaction and musical exploration. Sing, Laugh, Have Fun!! Let's face it, dancing is just FUN! I loved to swing dance with the kids and taught them both how to jitter bug!! Find music that makes you want to move and get out there and dance!! The rhythm of music facilitates and inspires movement. Have FUN!!!! Your kids will feed off your energy! This activity helps develop concentration. Play a recording of an instrumental song. Move around the room in different ways such as walking, tiptoeing, hopping, and twirling. Let you child observe you, follow your lead, and copy the movements. As your child becomes familiar with this game let them take the lead and you follow them! This activity nurtures your child's creativity. Give your child a scarf or a piece of cloth. Play a recording of a song and let your child wave the scarf to the rhythm of the music. Wave the scarf over your head and across your body crossing midline as often as you can. Your child will improve listening skills with this activity. Play a recording of a song loudly or softly. Tell your child to listen carefully to the song. When it is loud, he or she marches around the room. When the music is soft, he or she tiptoes around the room. This fun activity helps your child improve concentration. Play a slow piece of music and have your child stand facing you. Move very slowly using a variety of arm and leg movements while your child copies you. Then let him or her make the movements while you mirror them. Musical Instruments can also be used during movement activities. 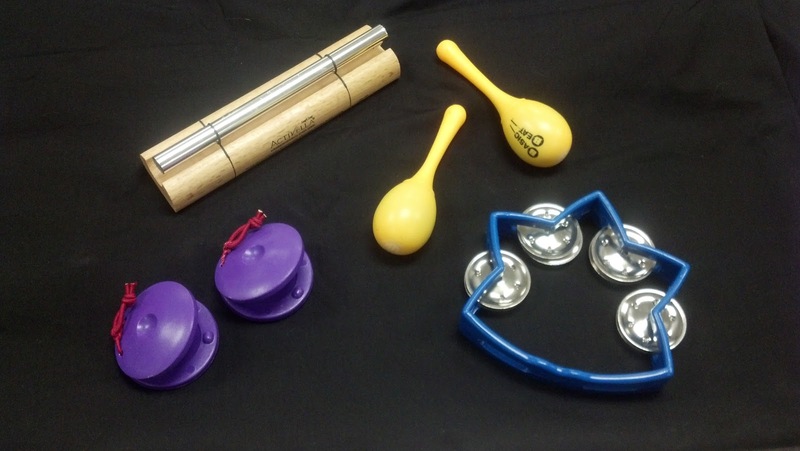 Instruments can be a motivating way to encourage grasp/release, bilateral integration, eye hand coordination, crossing midline, cause/effect skills, and basic motor imitation. New Orleans -- shake side to side all the way to the floor (I like to have the kids bend their knees to work of quad. strength if unable to do this movement simply have them reach down as far as they can go. For my upper grade levels I have even brought in a map to show them where each of these states and city are located. From there you can open up discussions of how long it would take you get there, the climate, culture, etc. I hope you enjoy these songs!! As promised, here is the very first activity for Melodic Approaches. I debated and debated over what should be the first music strategy. As a perfectionist I get caught up in “trying” to make everything just right before I try something new or allowing someone to hear a song I’ve been working on or even creating my session plans. Well life isn’t perfect and no matter how hard I try, neither am I. I have also learned over the years that opportunities fly by if you never put yourself out there and try. The premise of this blog is to share my thoughts and strategies that are working for the students I work with. I do not claim to be a top expert in my field or a professional grammy award winning performer. (My “recording studio” is in our craft room and I sing into my daughters karaoke machine.) I am merely just a music therapist who happens to have a passion for teaching others how to use music to help our kiddos reach their full potential. During my music therapy sessions this week we have been talking about how each one of us is given talents and how each of us are different in our own way. The students helped devise a list of their talents and things they are good at. We then discussed things that are hard or challenging for them and made a list. I made sure the list of strengths were much longer than the list of weaknesses than we talked about how everybody struggles with something sometime. When we finished our discussion we sang the following song, I’m not Perfect by Laurie Berkner. Laurie is one of my all time favorite children's’ song writers. I have been using her songs during music therapy since 2001 and tell all my friends when I grow up I want to be her! You can only imagine how excited I was last year when I was able to see her in concert! I did bring my children and 2 year old nephew so I wouldn’t look out of place. I'm not perfect, but I've got what I got. I'm not perfect but I hope you like me anyway. But you've got what you got. You do your very best, you do your very best. You do your very best each day. But you know I like you anyway. But we got what we got. We do our very best each day. But I hope you like us anyway. o Melodic Approaches is a new private practice that provides music therapy services and (adapted) music lessons for individuals of all ages and abilities in the Reno, Nevada area. (services will begin Sept. 1, 2013) Please contact me @ shaemtbc@gmail.com and join my waiting list!! I love writing music based curriculum which incorporates academic, communication, physical, or social/emotional goals related to children and teens development.